If you’ve been hanging out around this blog for long, you might have picked up on the idea that I LOVE decorating. Heheh. Seven years of blogging and I’m still here chatting away about how much I love it. But in all my years of decorating and setting up our home, even before blogging, there is one decorating accessory that I probably have used more than any other. You may be able to guess what it is! Yep. WE LOVE BOOKS. 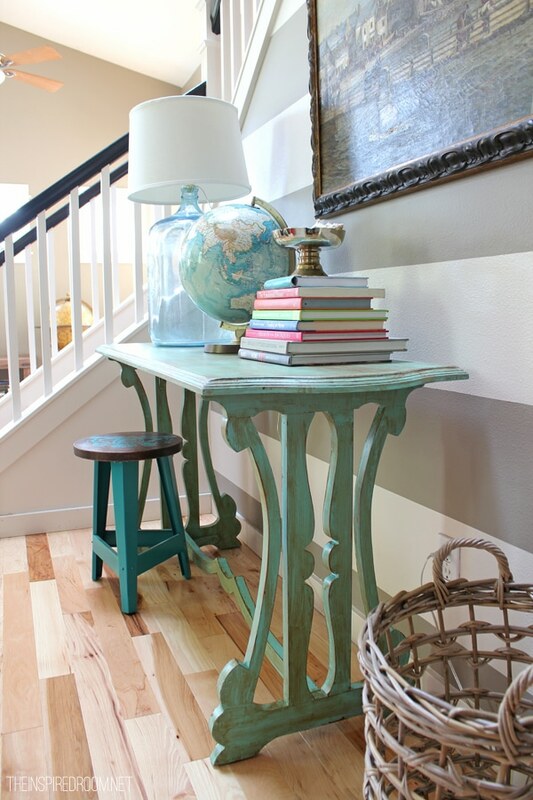 Not only do we love reading books, we love looking at pretty books around the house! 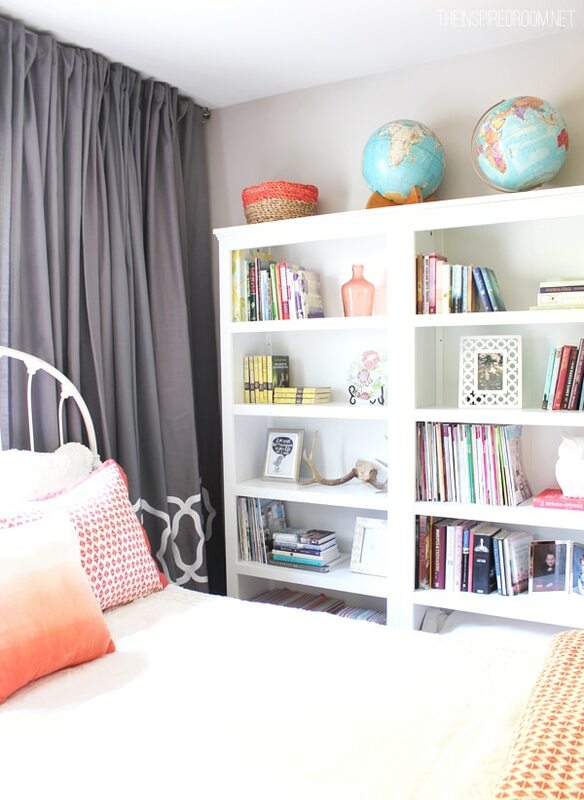 Books add color, pattern and character to a room, yet they never go out of style! In my book, that’s a PERFECT ACCESSORY. :-) HAHAHAH! In my book … that’s a pun. Get it? I crack myself up. Alrighty, moving on. 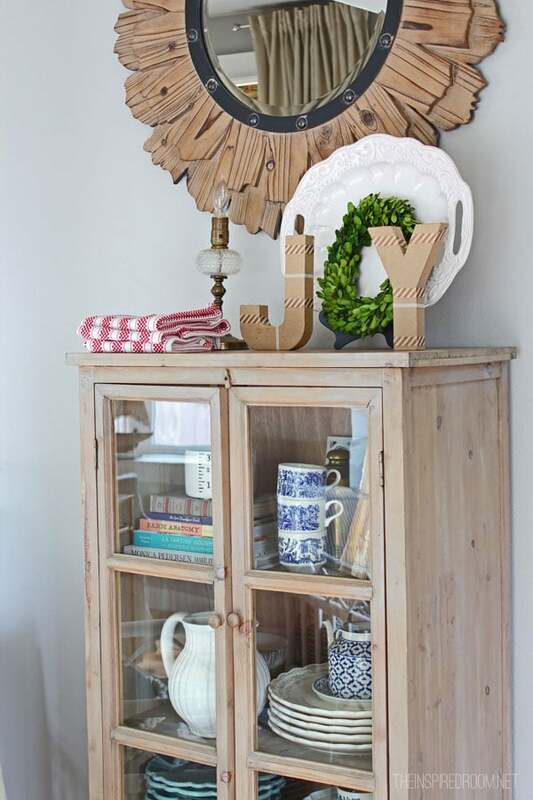 It’s fun to collect something that can be used in any room in a variety of ways. You can move them from place to place, organize them on shelves or rooms by subject or color, stack them, lean them or just leave them laying around! They are one of the most versatile decorative items I own, but of course they are also meaningful. Books not only tell a story in their pages, but they tell a story about you and your family in the home. Surrounding yourself with what you love is what makes a home so personal. What you read or love to see in your home tells a lot about you and your family. I really enjoy browsing bookstores. There is something so relaxing about wandering the aisles. A book store is like an adventure where you can travel the world, explore new places, ideas and cultures. I love looking at decorating books and cookbooks that interest me, but the real treat for me is the visual feast of looking at all the book covers, the fonts they use, the colors. I also gravitate towards stacks of lovely books at gift or home shops. While many people might be drawn to buy some trinket to set on a table, or maybe a vase, dishes or something for the wall, I am more likely to walk out with a decorative or attractive book. I feel justified in buying books because I know I won’t tire of them. We have many different types of books at our house. I don’t have pictures of all of them, but there are books all over the house. My husband has tons of study books and Bible commentaries, he loves to read sci-fi books, and he has lots of reference books for his work in ministry. Not all of our books are pretty, but I won’t lie, I do tend to gravitate towards those that are! I have lots of decorating books, books on marriage, family, homemaking, bible study books, and gardening books. I love books my friends have written, and of course I love stacks of magazines too! While we have iPads and Kindles, there is nothing like a real live hardcover book. I would never have a house without them! They add so much, without them our home would feel so much less personal. Sometimes I stack books to elevate accessories. Sometimes I keep them near the couch so I can kick back and thumb through some of my favorites. Sometimes they are just piled up here and there at random. When our puppies were less trustworthy, we would put books in a wire basket to protect them from puppy teeth. When we would forget, our books would get a few chew marks. I suppose that just adds a new level of charm, right? I tuck books in everywhere and move them about on a whim. I keep lots of books in my office to inspire me in my work. Sometimes I just pile them up on our mantel to add color or inspire a lazy afternoon by the fire (even if I just dream of one!). 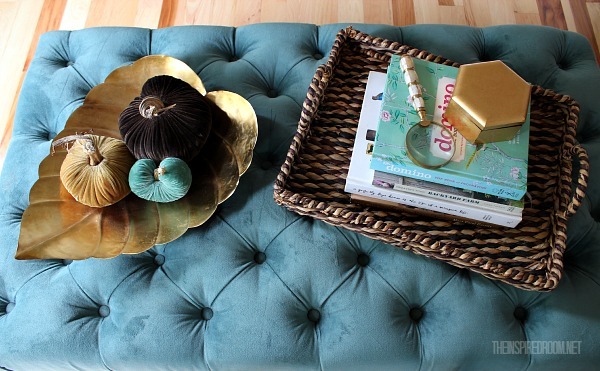 I think books add warmth to accessories, so I love mixing the two. While some women might decorate for the holidays with crafts or themed decor, I might simply change or rearrange my books to fit with a color scheme or season. Everyone in the family has books to read by their bed. I never say no to buying a good book! I love seeing books piled in my son’s nightstand, but better yet, I love when I see him reading a book! Decorating with books, now that’s my type of decorating. I love having beautiful bookcases. Big ones, small ones. It is so fun to save old books. I have some great Life magazine books from the 60’s, and a rare bible from my Great grandfather. I think you are right a Kindle wouldn’t be the same. Just as a letter or note you can save for a lifetime, but an email doesn’t do the same thing. Agreed! You have some beautiful and intriguing titles there! I’d love to spend an afternoon browsing your house for the books alone! I think I’ll be adding a few items to my Amazon wish list…. We are kindred spirits! I also love books, I think you are describing me too! 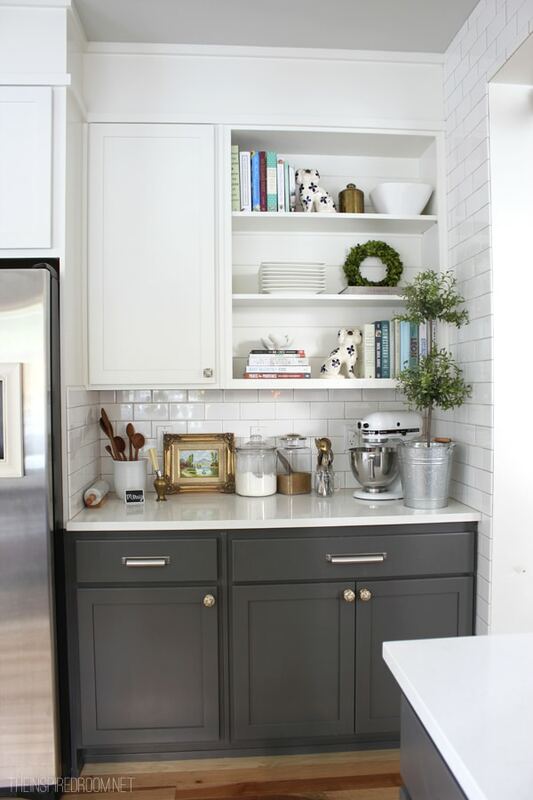 Love this post and especially the way you use books and accessories in your kitchen–so inspired! I am so with you on this, Melissa. Books are like loyal and comforting friends. Completely agree! It’s funny to me that some people get really angry about books being used as decorative items. But why can’t they be both? They are wonderful collections of thoughts and words and they are decorative. I can’t get enough! I am also constantly buying books. There is just something about flipping through the pages that I will never be able to switch to reading on electronic devices (plus it hurts my eyes! :). I LOVE BOOKS I LOVE BOOKS I LOVE BOOKS !!!!!! (caps intended) I have many books but most of them are on shelves (we built) about 18″ from the ceiling in 3 rooms. When we moved into this house I made an entire wall of shelves in the den but found they were visually overpowering the small space; hence the upper bookshelves. I alternate which ones I bring down to read or have ready to read when I have a few seconds to pause. In the past I used my beautiful free standing china cabinet to store books accessorized with a few china pieces, but as time passed I acquired more china and glassware. Maybe I will donate some of my glassware/china to make way for more books. : -) I don’t want to donate books until I have read them. Almost all are non-fiction. Your post is an encouragement (thanks) to bring more of them down from the shelf and incorporate them into my surroundings. I’m a teacher and my husband is a minister. We are both voracious readers (paper and digital). I have books in shelves all around the house. Your post inspired me to embrace the books that are inevitably lying around on tables and just let them be part of the decor. Thanks! I went back and read about your life outside blogging. Sending you prayers for continued blessings in your ministry. I just LOVE your home, Melissa – it’s so warm and inviting. You have such a great decorating style. I was drooling over all these gorgeous photos! Yes, yes, yes! We are a family of book lovers! And we never seem to have enough book shelves. :-) So we have baskets full of books in various places. While I love reading blogs (yours and the Nester’s are my favorites), nothing is better than a real book! Hey Melissa! Love your blog. 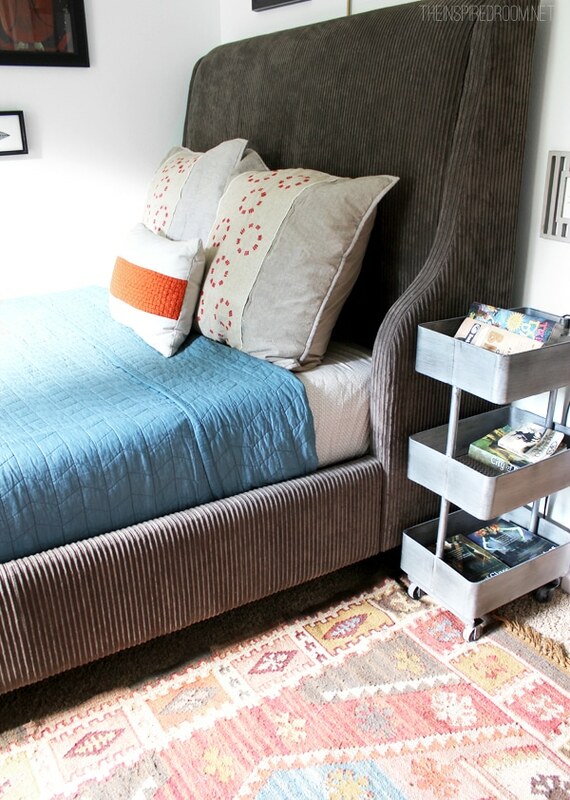 I have been trying to locate the Abbey Wingback bed in the full size and it seems to have sold out everywhere. Could you recommend something similar? Or do you have a secret way of finding me one? Thanks for you and your great blog!! 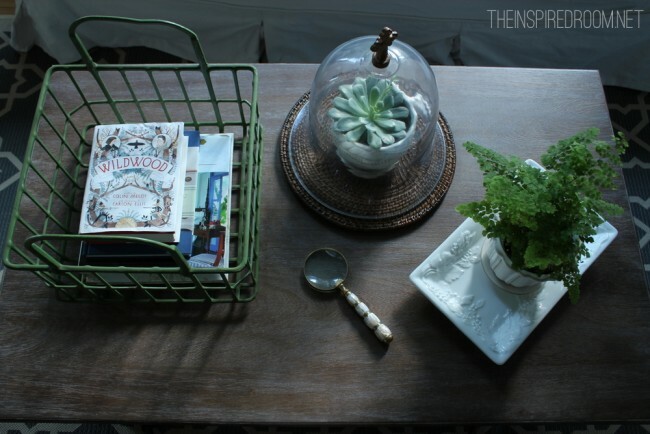 I agree books displayed in decor bring a certain cozy feeling to the home. 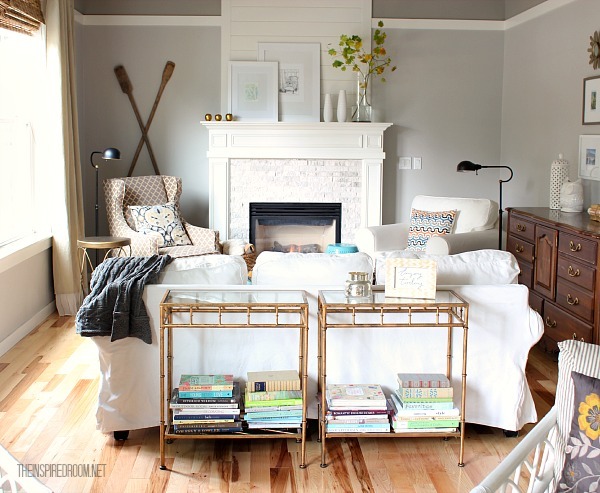 You do a great job with assembling them to coordinate with each room! I love books too! I have run out of spaces in my home to put them and there are always a stack of magazines by my favorite chair. I’ve tried to donate some I know I’ll no longer read or pass them on to friends, but I still have so many I haven’t read. My husband bought me a kindle, but it’s just not that same as holding a book in your hand and feeling the pages between your fingers. Books! It seemed too obvious! You use them so well too. The only books we really own are school books and childrens books. Not exactly decorator friendly! Oh, gosh — I share your love of books + always have! I remember the “high” I’d get, every Xmas season, walking out of Barnes + Noble with a huge stack of books suited for everybody on my gift list! But, speaking of Barnes + Noble — I worry about them! I just ordered Robert Osborne’s 80 Years of Oscar book from amazon + am feeling guilty/conflicted. The prices can’t be beat, + we get our orders in 2 days or less. It’s kind of hard to resist. ^^ Oh, dear — I do have a blog, but that’s not my blog post. ^^ Wondering if I’m doing something wrong. Ah, we love books so much around here. We are currently living as expats though so, after lugging boxes and boxes of books across four continents with us, we purged down to our absolute favourites for now. Once I get a permanent home again though, all bets are off! Oh, and I love that quote! I think I might put that in a frame somewhere. We love books to! Especially for home decor. When we travel we always try to pick up a book or two to add to our collection. 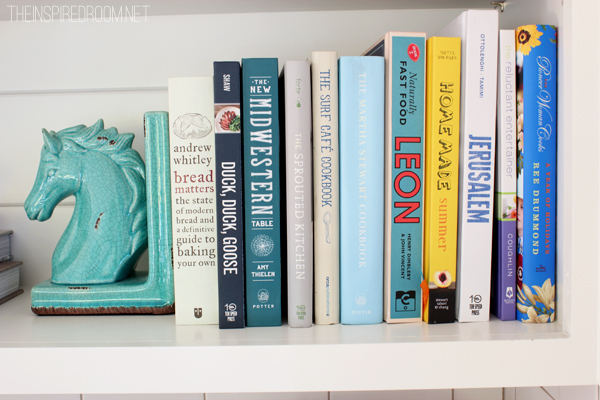 Whether it be a cookbook or a book about the city or even one that just catches our eye. It’s so fun to display then and every once in a while thumb through them and relish in the memories! Don’t you just feel sorry for those without books. Book are the windows to the world. And I personally have been at a loss of late– Style my bookcase????? I don’t get it….Mine are full of book (Neatly arranged -none the less) but bookcases full of anything but books?????? I feel they miss more than the books. I don’t have a kindle and so much I am missing by this computer age. LOL Nothing will ever replace the feel of a good book, when you read that last page- close the cover, hug the book, close your eyes and dream. Just love gorgeous decorating books, gardening books and any books with pretty covers. It is great to see the many ways you can display books. Love your emails. 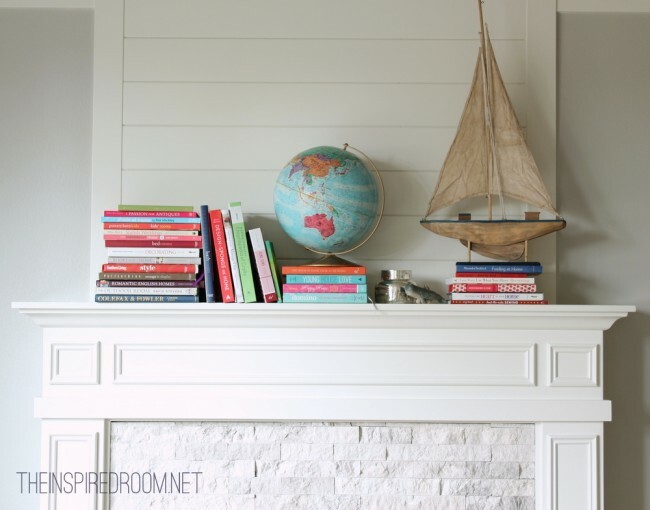 I read this post in a room that will someday (hopefully soon) house the bookshelves my husband and I plan on building in our new home. I do love visiting bookstores and looking at all the new titles but my greatest pleasure comes from the yearly book sale that takes place in our neighboring college town. It fills a school’s entire indoor gym and cafeteria with tables piled with volumes, some recent but many vintage with yellowed pages. I always consider it an added treasure when I find one that has a hand written dedication on the inside cover dating back to the early 1900’s. I feel as though I am preserving a little bit of someone’s history and adding character and warmth to my home at the same time. 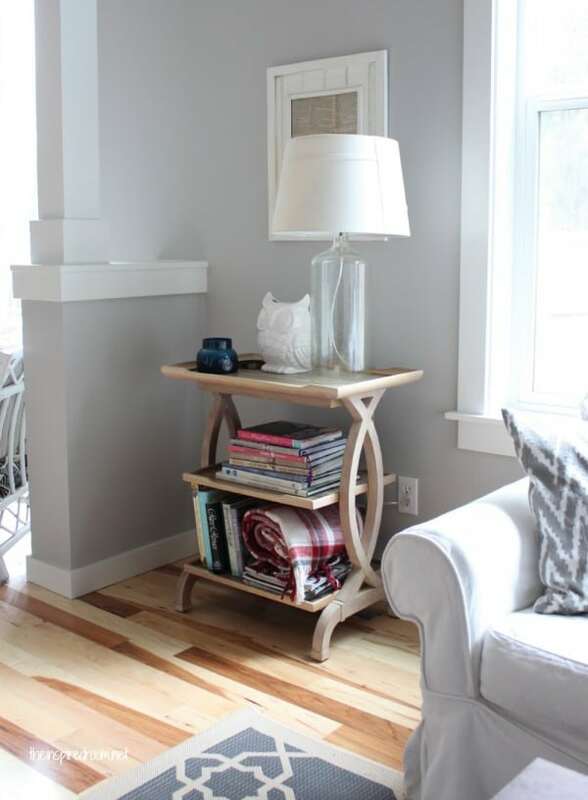 Yes, it’s called Polished Grey by Glidden! :-) It’s a quite few shades lighter than Glidden Wood Smoke which is what our ceiling in that room is. I love this post! 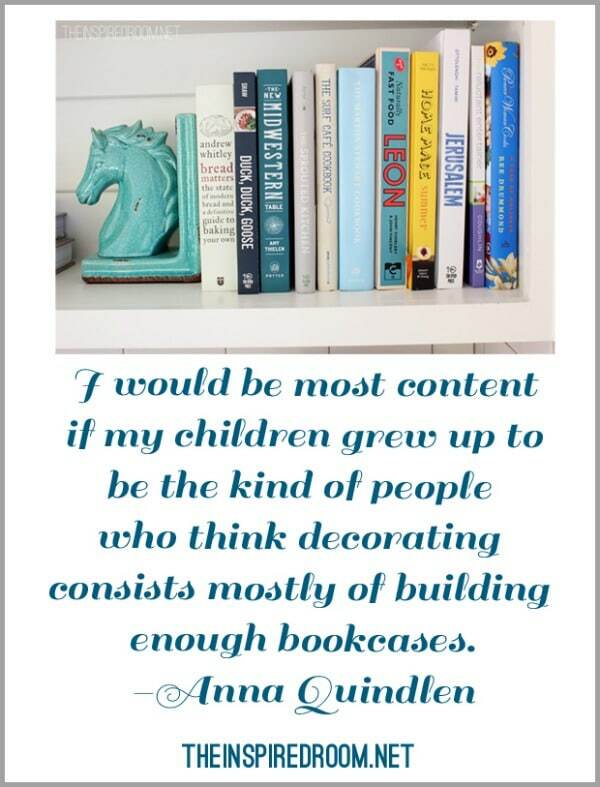 We have books everywhere in our house and I have also used them as a decorating staple – even as a side table in our family room by stacking then next to a big arm chair. Love the Anna Quindlen quote too. I love this post! Books are such a great way to display your family’s interests and personalities! Would love to use this in my house, maybe in a few years. My 17 month old son loves to pull books off shelves, tables, anything he can reach. 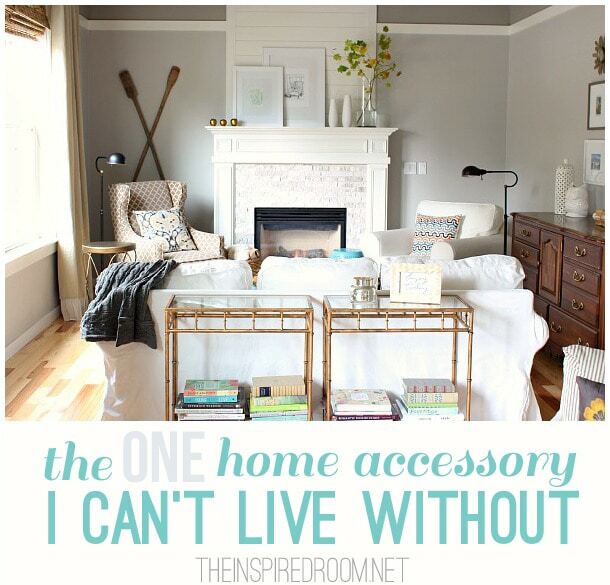 A house just isn’t a home without books and family photos! I love this post! 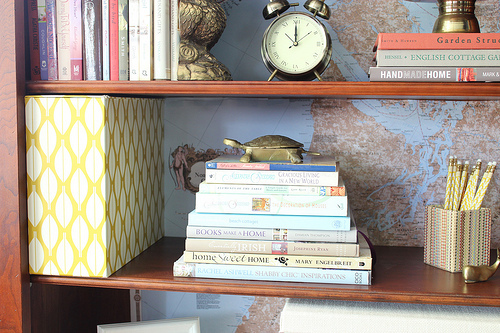 I’ve always considered books and bookcases to be thick wall paper. You are talented at displaying them. Thanks for the ideas. What color is the Black door, and why did you paint it black? I couldn’t agree more, I love to read and books are something I couldn’t live without either. I too love to pile books to get varying heights, for little vignettes, and of course colors and even titles are picked for the season. I use books in shades of red and pink, or gold foil that mention love, romance, or hearts in the title for Valentine’s Day. I have some Mysteries and ghost stories,that are fall colors or black etc. that always get grouped around Halloween. I have even thought about selling groupings of books( like I use myself) for Holidays. If I can find some books for an Easter theme I just might! One quick question, please. I have lots of books and do use them everywhere. Should I remove the jackets? I have many signed books and I think removing the jacket devalues them. It is much harder to decorate around the jackets, but I’m just not sure about removing them. Thanks! If I don’t love the jacket, I just get rid of it. If I had a valuable book perhaps I would reconsider (or just save the jacket) but I know I have my books for my own enjoyment and if the jackets are in the way of my use for them, I just recycle them. Agreed! 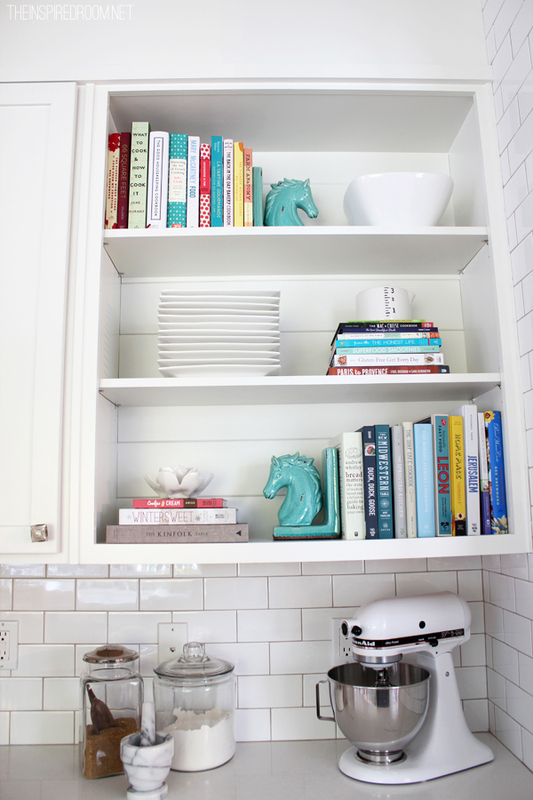 I also love books and the way as you describe them especially the way you use books and accessories in your kitchen. I love you blog. I love, love, love your blog! You’re a genius and truly great at this- God bless you for sharing these tips! Where can I buy the table that has the white owl and clear glass lamp on top? Oh my god! You’re so much my idol!!!! I love books. I can’t possibly read all the books I have and I still get more. I carried your book around with me for 3 weeks every where I went after I got it (even to work-I’m so bad). I love it and I love your accessories. I’ve gotten a couple for my home and I’m so happy with them. Since I got your book (The Inspired Room) I finally got a plan of action to make my home really how I want it. I’m so excited to get started. Just wanted to tell you I found a footed cutting board similar to yours at Heritage Lace. I really like the one you have and this one is very similar so YAY! Thank you for all your lovely posts – I’m thinking of getting another of your books soon. I haven’t started having order withdrawals yet so maybe a couple of weeks….. Thank you so much, Lisa!! !